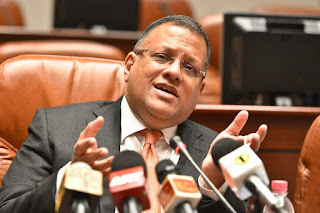 Former Central Bank Governor Arjuna Mahendran said he will before long prove himself innocent of allegations and charges of wrongdoing in connection with the controversial Central Bank Bonds issue. In a telephone conversation last Friday, from Singapore, he said he was not hiding away to duck this issue, but was prepared to face any probe to clear his and his family's honour. He said his son-in-law Arjun Aloysius was not a director of the controversial primary dealer Perpetual Treasuries at the time of this controversial Bonds issue going on the boards at the Bank. "He resigned immediately after my appointment as Governor of the Central Bank of Sri Lanka. But, I was aware that all bond transactions and decisions were done through Perpetual Treasuries' CEO and not by its directors," he said. He said as the Governor he had instructed the Public Debt Department to abolish the long practised, corrupt private placement procedures related to issuance of government bonds and instead introduced a more transparent and open bidding process. "All this blame is because of this open bidding process. Corrupt primary dealers are creating all the problems," he said. The COPE report tabled in Parliament last Friday held Mahendran responsible for the controversial Central Bank Bonds scam. COPE has recommended legal action against Mahendran.